Europe appears to be resurfacing as an issue in the Tory leadership race. Top Tory donor Stuart Wheeler - who gave the party £5m for its 2001 campaign - has threatened to stop donating if Ken Clarke becomes Tory leader. On Radio Four yesterday Mr Clarke (pictured with Tony Blair at the late '90s launch of Britain's pro-euro campaign) refused five times to say if his once passionate pro-euro views had changed. Few, however, can doubt Dr Fox's Eurosceptic credentials. Today's Telegraph reports that Dr Fox has promised to pull the Conservative Party out of the European Peoples' Party if he wins the leadership. Conservative MEPs are currently members of the group which recently reaffirmed a commitment to one day realise a United States of Europe. Promising to pull out of the EPP Dr Fox will highlight the group's beliefs in "powerful trade unions, redistributive taxation and a high minimum wage." ""Change to win," says David Cameron. 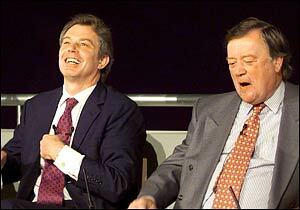 "Time to win," counters Kenneth Clarke. "Modern Conservatism," suggests David Davis. Thankfully the Conservative leadership election is not a caption-writing competition. Yet, also thankfully, the launch of these underwhelming slogans is offset by a statement of real substance by another candidate. Most things said by the leadership hopefuls are promises of what they would do in government in 2009 - an event remote in time and, some would say, in possibility. Yet Liam Fox promises to do something within his power as opposition leader this December: to withdraw the Tories from the European People's Party in the European Parliament." Dr Fox's strong position on the EPP is only the latest example of his "braveheart-spirited" campaign. He has also adopted courageous positions on abortion and Iraq. This may attract admiration from core Tory supporters but viewers of 'Yes Minister' will remember that Sir Humphrey's most damning verdict on any policy was to tell his minister that it was "courageous". A Fox leadership could be hugely controversial amongst the party's Euro-enthusiasts and social libertarians. For membership of or donations to the Conservative Party to be dependent on a single issue is single-issue politics - and it doesn't work. This party has one member one vote. I’d happily tell the man with the cheque book to go away for attempting to get otherwise. If you want respect from voters, that’s the way to get it! the way to get money is to get into government. I'm yet to see how Fox is going to do much to get the conservative party elected other than bang on about the same old stuff. I will not vote for any candidate that mentions Europe between now and getting my ballot paper. Got to move on to get anywhere. I fail to see how the emphasis on healing the broken society and standing by the vulnerable such as the mentally ill, or battered wives, and championing a human rights based foreign policy qualifies as "the same old stuff". Or did I miss the commitment to development aid for Palestine in our last few election manifestos? Or the consideration of Britain's futire energy needs? I would support Fox on his plan to withdraw our MEPs from the EPP,was always amazed that IDS and Howard allowed it to continue.But please,please don't let Europe become a defining issue of this election.How many times are we to fight old battles? Agree with you Mark about Stuart Wheeler,the party should have the nerve to tell him to go to hell.It would make a nice distinction with our corrupt Prime Minister that money can't buy influence. viewers of 'Yes Minister' will remember that Sir Humphrey's most damning verdict on any policy was to tell his minister that it was "courageous". Viewers of "Yes Minister" will also remember that Sir Humphrey used this word to discredit policies that were right and that would have taken power away from civil servants, and returned them to elected politicians or the people. Fox's policy on the EPP is the thing we should have done years ago. Hopefully it will undermine Ken Clarke. All I can say is good on Liam but what else on Europe are his views would he go as far as seeing a time when we are not in the EU? EU Serf, it's possible to be pro-European, anti-European or undecided. The majority of the electorate (the missing votes) are undecided because there are so many facets to the argument. I freely admit that I don't know the right answer. But I do know that we will not win the next election if each voter has to decide upon Europe before voting Tory. Europe does not need to be the cornerstone of Tory policy and the more you push it, the more you push voters away. Mark,I think it is now safe to elect Ken in a way that it wasn't in 1997 or 2001.The battle both in the party and I think in the country has been won by the Eurosceptics.If Ken were to win he would be forced to appoint a eurosceptic shadow cabinet, he would lead an overwhelmingly eurosceptic parliamentary party backed by an overwhelmingly eurosceptic party membership. Ken is not a fool he must know this and be comfortable with it. Yup, IMO Ken isn't pushing Europe - and he seems to be the only one who's not. Dream scenario: Fox becomes the Right-wing candidate, gains momentum, and it goes to Fox vs Davis in the members' vote. They keep the contest clean and positive, Davis wins as the more moderate, electable candidate with Fox stays on-board with a senior shadow cabinet post, shoring up the core vote. I'm not sure that having unadulterated policies on europe, abortion etc will drive voters away. They like to see clarity, they stray to more extreme groups simply because they know where they stand. I think pulling out of the EPP is a timely move, the EU is in a state of flux to some degree and this could help start a more Conservative-Party-esque movement. We would in fact get more money from the EU as a party in a smaller group wouldn't we? And if like-minded groups joined us we would form one of the largest groups, bigger than the liberals. I may be wrong here, but the Conservative Party is not actually part of the EPP. It is, however, a part of EPP-ED which is a group in the parliament. EPP is a European party while ED (European Democrats)is an informal group of parties (the Conservatives, the Czech equivalent and the UUP) which is yet to form a real European party. EPP-ED is the common parliamentary group of these two groupings. You will find that the Tories are not listed as a member on the EPP website, but on the EPP-ED site. Liam Fox must be referring to withdrawing from the EPP-ED, which I think is a good idea because the EPP is very europhile while the members of the ED are eurosceptic. I think post enlargement the parliament is due a re alignment anyway and a smaller conservative euro sceptic group might be a possibility but it would lead to a future conservative government being alienated in the EU and having very little evidence. Mandelson may be a nasty character but he does give britain a lot of influence as he holds one the the key positions. Don't understand your post Wasp,what evidence should the Conservatives have? Mandelsons appointment as a Euro Commissioner is a double edged sword.He is so distrusted here and is such a poor advocate for any cause he believes in he will make the institutions of the EU even more unpopular than they are currently.Depending on your point of view that good be regarded as a good or bad thing.For me it's good,so more power to your elbow Peter! I think "evidence" should read "influence", Malcolm. In the real world out on the streets where elections are won and lost europe is simply not an issue. Its about time Conservative party members become part of the real world, accepted this and started to think what candiadate in the election is most likely to get the party back to power. If the party does not choose Ken Clarke this time I get the impression that not only will the public at large think we are mad but will also view the party as one full of obsessive talkers who are more interested in trying to win arguments than winning elections. For god`s sake lets give the party a chance of winning next time not repeat yet again the mistakes of the past. It is a very shrewd move of Fox's precisely because only the anoraks like myself understand what he is talking about. Making the EU the centerpiece of a leadership campaign or election would be foolish. Unfortunate, but that is the truth. Putting KC in charge would virtually guarantee that such a thing would happen, as his opponents would use the EU against him to try and split the party. Whoeever becomes leader should make this move which the general public will ignore but will shore up our flank against UKIP come the election. I agree Serf, having Ken Clarke as leader will make Europe more of an issue than having say, Fox. UKIP voters are so blind to politics that the only way to win them back would be a policy to pull out of Europe. A promise to withdraw some MEPs from an obscure political club is not going to do the trick! The public are not concerned about the EU because the arguments about its influence have never been put centre stage. It is deliberately side-lined and not discussed, for fear of frightening the voters. Political leaders should have the courage to put the controversial issues before the people and win the arguments. The EU and immigration are big issues and must be addressed. If Liam Fox is brave enough to give clear policies, then he deserves a lot of praise and votes for doing so. What people are fed up with is soft soap and fudge. We shouldn`t be trying to win back UKIP voters as there nothing more than a bunch of right-wing bigots who would support the BNP if UKIP weren`t around. We should be trying to win back the moderate voters who have deserted the party and voted Lib/Dem or just stayed at home during the last two elections because they have been put off by the right-wing tone the party have adopted in recent years. They are the people who we need to attract to win not the right-wing nutters! You have absolutely no evidence for that statement about UKIP being bigots who might vote BNP have you? I don't doubt that there are some racist bigots in UKIP. But then there are racist bigots in every political party. It doesn't mean they are representative of the whole. Most UKIP members I've met are decent, former Conservative voters who just place a very high importance on one issue in particular. "We shouldn`t be trying to win back UKIP voters as there nothing more than a bunch of right-wing bigots who would support the BNP if UKIP weren`t around." How dare you make such a ridiculous and insulting slur? I voted UKIP in the 2004 European elections (I gave an explanation of my reasoning behind this elsewhere on the site) - does that make me a right-wing bigot? No it doesn't because a bigot is intolerant to those of opposing creed or view and my marginal preference for Ken Clarke in the leadership contest indicates that I am certainly not intolerant to those of opposing view at least. I suggest that before you make such a sweeping generalisation in future that you should first check a) the facts and b) your grammar (it's they're not there).